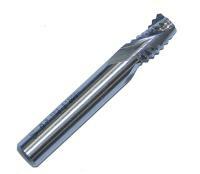 B00438 - High Speed Steel Router Bit: This is an 8% Cobalt, high speed steel, 3/8 rough mill router bit. The four flute bit has a curved cutting edge and shallow helix which alows it to shear as it cuts, using less force and producing less heat. BEST for cutting solid woods.